Here at ProMotion Orthotics, we make sure that we provide the best care and services to our patients. On top of that, we love learning and spreading the word about other organizations, both local and global, who do the same. The Capital City Condors is an organization that many of our patients are a part of and we wanted to share some information about the amazing work that they do. Founded in 2008 with just 3 players, the Capital City Condors are an award-winning family of fully inclusive ice hockey teams for children, youth, and dependent adults who are unable to play on any other hockey team due to a disability. During our 2017-2018 season (their 10th! ), they were thrilled to have a whopping 114 players on their roster! Wow! Players are ages 6 and up, of all ability levels and are each given a high degree of personal supervision by the Condors on-ice coaches. The Condors offer an excellent Learn-to-Skate program right up to advanced hockey skills. They accept players with a broad range of developmental disabilities including those with physical+cognitive disabilities….afterall #hockeyisforeveryone. Some players receive one-on-one attention throughout each session. Weekly practices consist of on-ice warm-ups and drills, followed by an inter-squad game. Fun, skill development, sportsmanship and teamwork are highly emphasized. Players of ALL hockey abilities are welcome – the ability to skate at the beginning of the season is not a requirement for registration. The program is a highly rewarding experience for the players, parents and volunteers as these special athletes who only dream of playing on a hockey team see their dreams come true and their abilities progress. 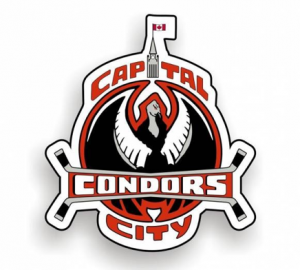 If you’re interested in learning more about the Capital City Condors, visit their Facebook page or their website.